Easter in Lebanon is celebrated by local Christian communities (Maronite Catholic, Greek Orthodox, Melkite Catholic, Armenian Orthodox, Syriac Catholic, Armenian Catholic, Syriac Orthodox, Roman Catholic, Chaldean, Assyrian, Coptic, Protestant). Christians make about 40% of Lebanese population. One of delicacies prepared for Easter in Lebanon is Maamoul. 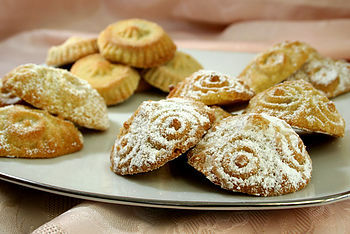 Maamoul are little cakes that are made with semolina, sugar, pound butter and water. They are filled with walnuts, dates or pistachios. After baking they are covered with some icing sugar. Making Maamoul is some sort of family business. Each family member prepares a different part of the cake such as decorating the cake tops, women preparing the dough. Finished cakes are laid out on trays or white sheets. The next day they are taken to the bakery to be baked. When going to church on Palm Sunday (Shaa’nini in Arabic) people wear new clothes or at least a new pair of shoes. A ceremony called shanineh is held then. Shanineh is a procession, led by priest and his helpers, in which the children holding candles are carried around the church on their parents' shoulders. The candles are decorated with ribbons and flowers. On Lent and on Good Friday people fast. On these days meat and animal products are not eaten. On Fridays during Lent period special church services are organized. They suppose to remind people of different stages in life of Jesus Christ. On Good Friday the statue of Christ is taken off the altar and put in a coffin. That coffin is then carried around the church in a procession. The statue is left in the coffin during Easter Saturday. At the midnight between Easter Saturday and Easter Sunday special Easter mass is held. What's happening on Easter Sunday? Let's take for example the Orthodox Christians of Lebanon. They attend a church service on Easter Sunday morning or midnight mass between Holy Saturday and Easter Sunday. On Easter Sunday, many families make a special lunch which includes turkey or chicken stuffed with nuts and served with rice. The afternoon is spent visiting friends and family members. Finally, on Easter Sunday people greet by saying Al Massih Qam (Jesus is risen from the dead). The other person answers Haqqan Qam (He has truly risen).